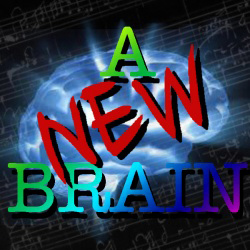 Moonbox Productions Presents "A New Brain"
Moonbox Presents "A New Brain"
Next up from Moonbox Productions is "A New Brain" from the Tony Award-winning team of William Finn and James Lapine. The engaging, life-affirming musical about finding serenity, humor and music in the face of death will run March 15 - April 6 at the Plaza Theatre at the Boston Center for the Arts, 539 Tremont Street. In "A New Brain," Gordon Schwinn, an anxious and high-strung songwriter, works for a weekly children's TV show. As he churns out a stream of mindless tunes and laments his artistic stagnation, he collapses, is rushed to the hospital and learns he has a life-threatening brain disorder that requires emergency surgery. Facing uncertain chances for survival -- and for keeping his creative faculties even if he does -- "A New Brain" offers a surreal, funny and very human look at Gordon as he catalogues his regrets, hopes, and fears, as he experiences a personal transformation around his near-death experience. As the show takes the audience on a journey inside Gordon's damaged mind and through his tumultuous relationships with those closest to him -- his mother, partner and publicist -- it offers unique and tender perspectives on the fleeting nature of time, life and love, and the inspiring power of art to heal and transform. "A New Brain" originated from Finn's real life diagnosis of an arteriovenous malformation. Fully recovered from surgery and later writing about his experience, a concert of those songs was produced at The Public Theater. Next came fully staged workshops in 1996 and 1997 which included contributions by Lapine. The original production was staged Off-Broadway at Lincoln Center in 1998. Andre Bishop, Director of Lincoln Center, wrote in his notes to the album, "The hero of the piece regrets things about his life and and will miss those close to him should he die, but his biggest fear is that he may not live to complete his work, to honor his talent, to write all the songs that are in his heart. " Reflecting on how the Moonbox production will create the show's essential dual reality and Gordon's experience as it plays out inside and outside of his own mind, director and set designer Allison Olivia Choat commented, "I think the world that we're building for this show will be unlike any other version of 'A New Brain,'"
From books that glow, doughnuts that dance, and pianos that explode, this production will strive to take a composer's internal world and make it external, so that the audience shares in every part of Gordon's journey. The cast includes Tom Shoemaker, Ross E. Brown, David Carney, Shonna Cirone, Shana Dirik , Lori L Italien, Peter Mill, Aaron Michael Ray, Allison Russell, and Matthew Zahnzinger. As part of each of its production, Moonbox spotlights the work of a local non-profit organization, helping them to increase the reach and impact of their work. For this production, Moonbox is pleased to partner with Massachusetts Farm to School Project. Massachusetts Farm to School Project seeks to increase access to healthy, locally grown food in schools and other institutions for the good of our children, our farms and our communities across the state. They facilitate matchmaking and sustainable purchasing relationships between local institutions and local farms, promote local food and agriculture education for students, and support networking of farm to school practitioners - growing a sustainable food system for everyone in Massachusetts. www.massfarmtoschool.org. For tickets, call 617-933-8600 or visit www.bostontheatrescene.com.